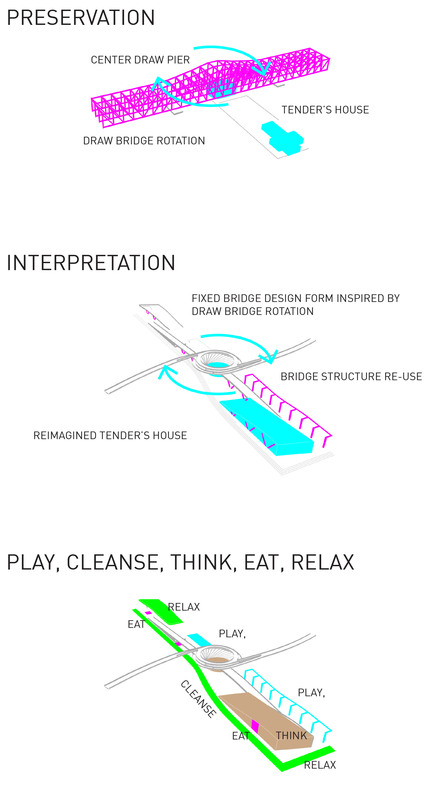 The City of Boston and the Boston Society of Architects invited the public to participate in an Ideas Competition about the future of the Northern Avenue Bridge. Kristina Stevens, Chris Bridle, Travis Ewen, Hui Tian, and Siyu Xiao answered the call with a dramatic vision to create a destination and improve mobility while preserving some of the key elements of the existing bridge. First opened in 1908, the Northern Avenue Bridge has served pedestrians, cyclists, automobiles, and even freight trains throughout its life. Unfortunately continuous exposure to salt water and air has caused extensive corrosion of the steel structure, and the bridge was closed to all traffic over a year ago due to safety concerns. 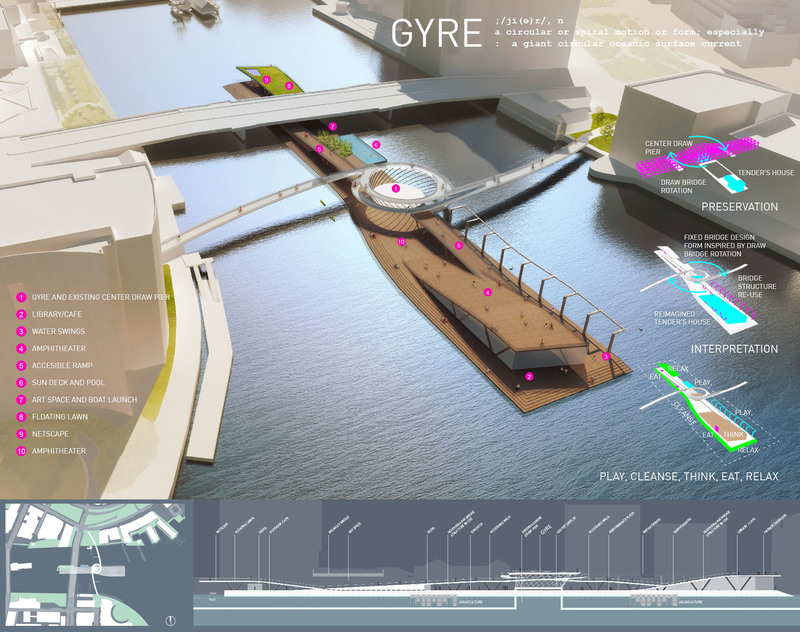 The team’s submission re-interprets the historical significance of the site and the bridge, reimagines community engagements, and enhances existing ecological systems within the urban context. The Northern Avenue Bridge served as a vital connection for the former industrial waterfront parcels surrounding the area. However, during the industrialization of Fort Point Channel the approachable, natural shoreline and its ecology was erased. This project has the opportunity to honor the bridge and the site’s historical significance, connect people back to the water and enhance existing ecological systems within the urban context. When the bridge was first built, a wooden deck known as the Wooden Fender Pier spanned 593’ under the open draw bridge, the longest wooden pier in the City at the time. At the center of the draw bridge is a 69’ diameter circular granite draw pier that contains the track system that allows the bridge to rotate. 1. Preserve structural truss members and reimagine them in the design. The undulating ramps from the Gyre Bridge are reinforced by the old trusses. On the western side of the pier a colonnade of truss members serve as the anchor points for large scale swings to allow people to swing out over the water. 2. Focus the design around the Center Draw Pier that housed the turning track system. 3. 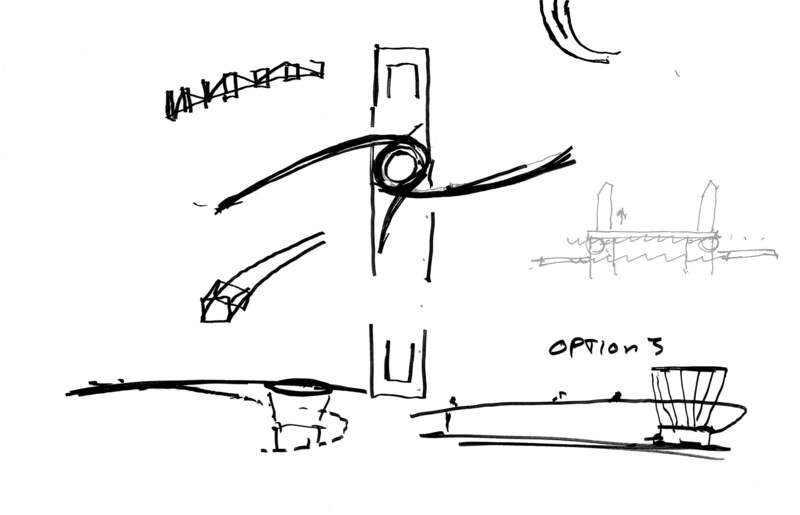 Celebrate and interpret the motion of the old draw bridge with a new accessible multi-modal pedestrian bridge. 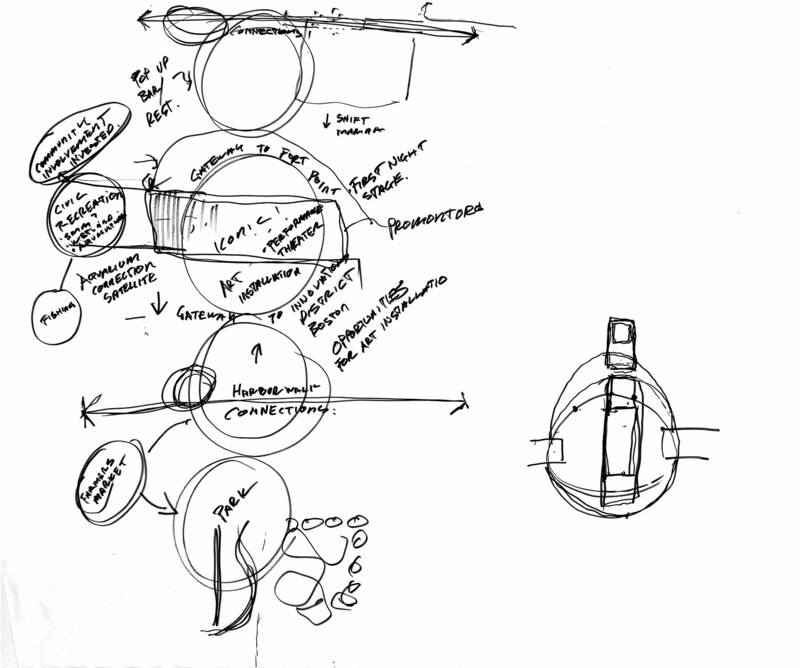 The design has two iconic components, the Gyre Bridge and the reimagined Fender Pier below. The bridge serves to connect the Innovation District with the Financial District while the deck allows for all citizens to experience a unique outdoor space not currently available in Boston. It is imagined that the bridge and pier are structurally separate from each other. During storm surges a mechanism is in place to allow the connection between pier and bridge to separate allowing the pier to float independently with rising tides. PLAY – Today the Harborwalk feels like a passage and not a destination. There is still a lack of opportunities for people to engage with the Harbor in a meaningful way. This proposal works to strip away the barriers separating people from the ocean so that the primal desire of feeling water can be achieved. CLEANSE – Ecological Infrastructure Huge successes in environmental planning have led to significantly cleaner water in Boston Harbor. Oysters, clams, and other bivalves and crustaceans were killed off in the harbor during industrialization. Bi-valves have proven to be effective natural cleaners of polluted waters. 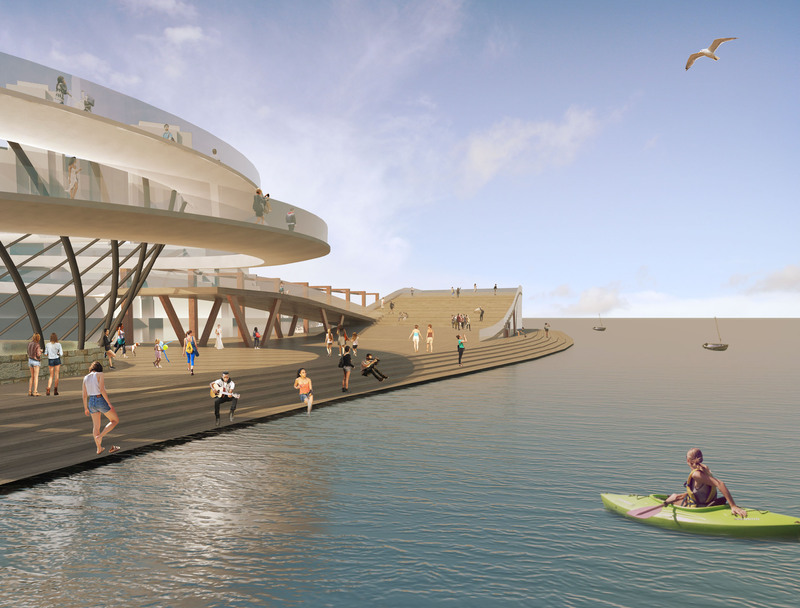 This proposal would create seed farms within the Fender Pier structure for a variety of aquaculture species in order to promote a natural cleansing of the Harbor and reintroduce native species back to the water. A research station open to the public would monitor and promote education of Boston Harbor. THINK – Cultural Economy The ICA serves as a cultural anchor for the Seaport district. Past temporary art installations in the area have served as highly successful albeit brief placemaking devices. 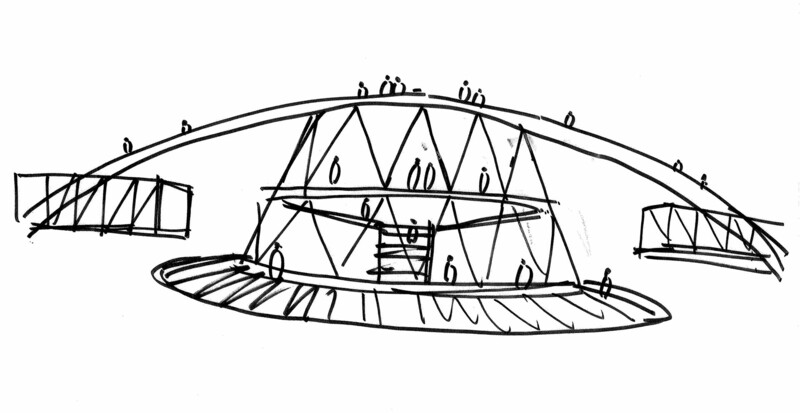 The Fender Pier would be a permanent destination for public art and performance. These installations could serve as opportunities to develop economic support for the bridge. A Micro-Library along with an Education Center will help activate the project and a place to bring together the growing community of people living in the Seaport. RELAX – A dramatic sloped lawn with an opening down to the channel below is slung with a net called “Netscape’ encourages people to hang out and relax. EAT – Café’s and kiosks are located around the pier to nourish visitors.